The Rule of Thirds : Rule, Guideline, Myth? The Rule of Thirds is the most well known, oft-quoted, venerated and yet equally controversial composition technique in landscape photography. No other rule seems to be held as high in the compositional pantheon, seemingly a technique to rule them all. 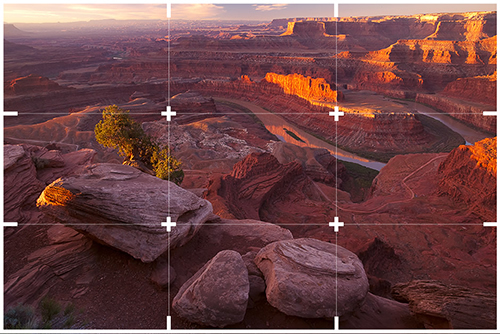 Review any list of composition ‘top 10’ and it is a safe bet the rule of thirds will be high in the ranking. It is a staple diet of many entry level composition articles, which define it as the prescriptive way to approach the placement and relationships within a landscape image. Now, the very idea that a subject as dynamic, intricate, unpredictable and chaotic as the natural world could consistently be constrained and orientated into a grid sits at odds with me on several levels. A rule by definition is a set explicit instructions, in which case the rule of thirds governs the arrangement of all elements in all landscape composition as a total absolute. Is anything which falls outside the ‘power points’ then a poor photographic composition? If this is too dictatorial a definition, then is the Rule of Thirds instead a general principle, one that when followed imbues photography with a guaranteed potency? Or is it more the case that the Rule of Thirds a myth, a rule of composition that there’s equal evidence to support and dismiss when viewed against any sample size of photography or art? Has it simply been quoted enough times to have slipped from common parlance, into unquestioned wisdom? According to the definition of the Rule of Thirds, placement of key visual elements onto the grid intersects is paramount. But how close to the ‘power points’, is close? Is there an acceptable level of proximity to the grid's convergence, if we stray too far and risk weakening our composition? This starts to feel incredibly loosely defined, subjective and very open to interpretation. Take this example, there's only partial alignment of the foreground rocks with the lower power points. 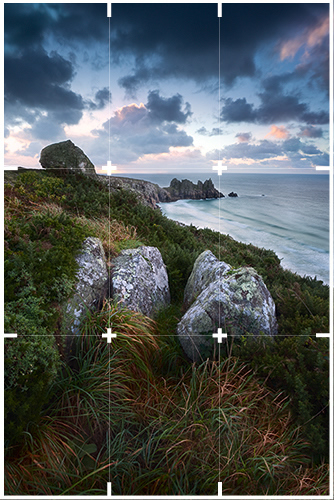 The mid and background elements of the solitary boulder and sea stack 'just' miss the grid intersects, although they are critical components and have a logical placement to ensure a sense of depth by providing a sequence of visual elements for the eye to track 'front-to'back' in frame. Placement of the horizon under the Rule Of Thirds corresponds to a 60/30 ratio of land-to-sky (or vice versa); a logical extension of this would mean total uniformity in the horizon placement of every image we took, which seems completely irrational. The arrangement of nature does not allow for such a rigid definition. In this image below, taken in Canyonlands, the sky is almost non-existent, reduced to a slice of the top of the frame. I wanted to ensure the 3 rocks where a dominant foreground element and this perspective created a strong diagonal across the width of the frame to the curve of the river. Also the Canyonland's sandstone was ablaze from the sunrise, and a main focus had to be the side lit buttes, adding any more sky (which wasn’t that colourful anyway) would have cost me the 2 elements I wanted to capture. The sky / horizon here was a tertiary compositional consideration. Horizon placement in the Rule of Thirds. Flawed thinking? Wherein lies my fundamental issue with the Rule of Thirds; it is only concerned about proportions and placement in a very strict and seemingly narrow minded manner. As the photographer we should be dictating what elements are placed based on what we want to capture, and what we wish to convey, as opposed to finding pieces of the natural world that align to this fictitious grid. I would argue that it’s damn near impossible to consistently find an organic fit that touches all 4 points on the Rule of Thirds' grid for the elements you’ve chosen in a scene. We must also consider what we are losing or discounting in trying to follow this schema. From a personal perspective I can’t follow such a structured formula as a basis for photographic composition. Having set ratios of sky-to-land, with focal points that always correspond to set areas will surely breed a level of repetition and, maybe most importantly, lost chances in force fitting the scenery (and your initial vision?) into the grid, or even worse, abandoning those shots that don’t allow us to follow the Rule of Thirds principles. Take this example below. Nothing remotely falls into the principles behind the Rule of Thirds, should I have abandoned it? Rule of Thirds ; no alignment, bad image? I think the Rule of Thirds has become a safety blanket. An easy reference point, allowing us to assure ourselves of a solid, good composition by ticking off certain alignments. It's self-assurance allowing us to overcome any doubt we may have around our choices of subject and placements of elements.